This limited edition, framed Apollo 11 cachet is a one of a kind collectible for a great price. 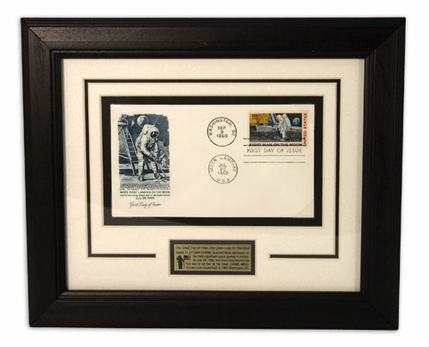 Contains an authentic first day moon landing cachet with a first man on the moon stamp. Frame can be displayed on table top or hung on the wall. This product was made in the USA. Plaque reads: Apollo 11 launched three astronauts on the most significant space journey in history. On July 20, 1969, Neil Armstrong became the first man to set foot on the moon. Limited edition, first day cover issued Sept. 9, 1969, Washington, DC.